The setup of S32 is performed by S32terminal. S32 gets it via USB if you press the “Save” button. The terminal reads the setup from S32 if S32 connects to the terminal through USB. With “Reload” you can read the setup again from the S32. When a SD is inserted, S32 looks for a setup file called “S32c.pdf” at startup. 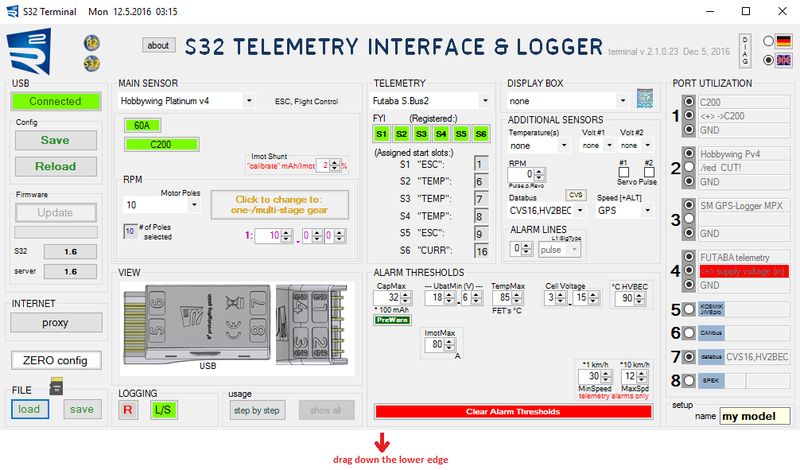 S32 learns from it a configuration which may be different to the previously stored in it. This could be useful if one moves S32 from model to model on the airfield. The setup file MUST be named “S32c.pdf” (as fixed as “CONFIG.txt” for JLog2.x). The setup file does not have any content that would be readable by the user, it is no text but binary. The extension “.pdf” serves the purpose that you can easily attach setup files to posts in forums. The name of the setup also appears in the header of each log file. S32terminal shows besides the current firmware version on the server in the Internet also the version currently in S32. 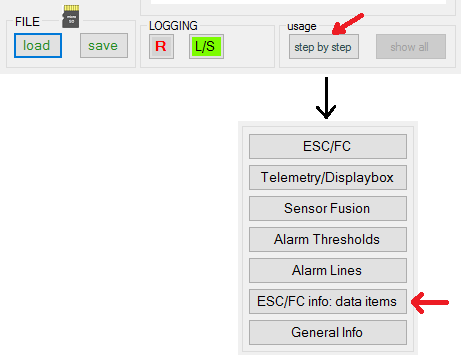 This means: this setup comes from a file, and it was created when S32 used the firmware version shown. At the moment this does not mean anything. There is no plan that any time an older setup could no longer be compatible to a much newer S32 firmware version. The terminal has the claim to be able to provide the user with all necessary information, saving a manual. In order for this to work, the user has to “work together”: Nearly every element on the desktop provides a so-called “tooltip” (pop-up with help text) when you hover the mouse pointer over it. Example: “Port Utilization” shows me port 4 as my telemetry port. I now want to know where port 4 is on the device: If the mouse pointer come over the “4″ of the port utility, the viewer window in the middle of the desktop changes the image. Tooltip: A speech bubble appears when the mouse pointer is hovered over an item. S32 on USB, – important note! Since Windows 8 there is a special feature of the OS with regard to HIDs: A HID is disconnected by the OS after a few seconds if no communication with it takes place. Microsoft did this to save energy in portable, battery-powered PCs. 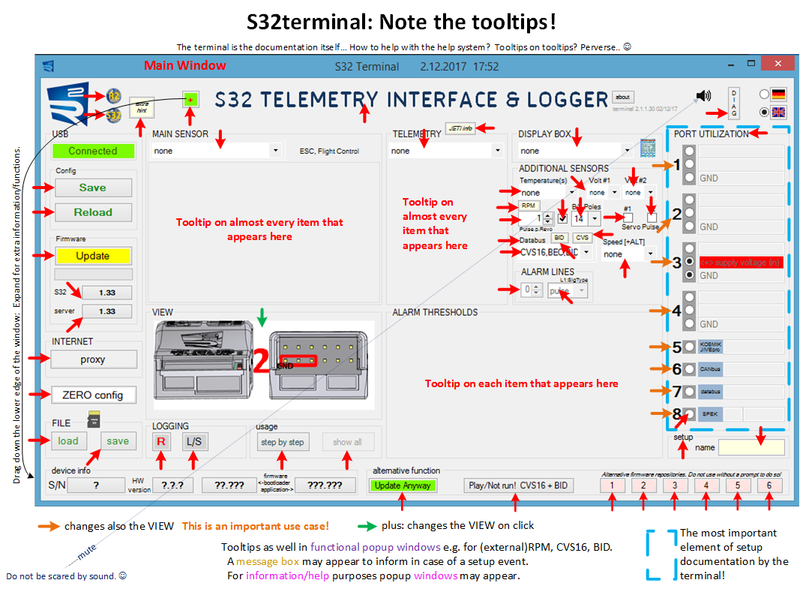 If S32terminal has not yet started, but S32 is already plugged into the host’s USB port, then this would cause an annoying effect: The OS disconnects S32, S32 comes back immediately to re-connect. Result: Constantly connect/disconnect sound from Windows. – Therefore, S32 does not return to connect if the host deliberately had disconnected. As a sign of being “upset” by this S32 turns on its red LED. Now you start (finally ) S32terminal and plug S32 back to USB. ==> The startup of S32terminal is prevented if an already “piqued” S32 hangs, red LED on. The terminal sees the electrical connect but does not get any logical one, – it tries constantly, freezes, until S32 is disconnected. Windows remembers the S32 is connected, tells that the terminal on request, but the HID (S32) went to sleep. Therefore (if Windows>7), first start the terminal, then connect S32 to USB! If you do not stick to this rule, you will see (respectively hear). Serial number and hardware version, also bootloader version, may be of interest in a support case. Such information (and more) to be found in the header of each log file as well. There is also a text page in HoTT telemetry or on a SmartBox for that – which is also showing the unique CPU ID in addition to the S/N. “Update Anyway”: Terminal offers to update S32 with the current firmware on server even if the firmware version in S32 is equal or higher. “Alternative repository”: Use only at the request of the support. “Play/Not run! CVS16+BID”: Currently: Never connect a CVS16 in parallel to a battery tag “BID” on S32′s data bus! That would destroy CVS’s calibration data immediately because of device address overlapping on the bus. – Pure from interest can one but with the combination play in S32terminal. Also note: This may help to avoid puzzles due to missing data. what you get to see when a soundtrack tries to virtually shorten the wait time for the update is an involuntary advertising. The purpose is to be allowed to use a (this) license-free soundtrack.